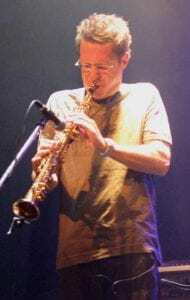 A Rivière du Loup native son in Québec, Canada, François D’Amours was only 13 when he first learned to play the saxophone. He immediately fell in love with the instrument, abandoning his earlier dream of playing drums. From then on he focussed on studying music, first at Ste-Foy high school, then at the Colleges in Ste-Foy and St-Laurent, finally completing his studies at the Université de Montréal. His unique style and tone quickly made a name for him, making him much in demand in jazz and popular music circles. He has been seen–and heard!–with such artists as Gino Vannelli (world tour), Michel Cusson, Alain Caron, Paolo Ramos, Garou, On the soundtrack of “The Triplets of Belleville”, Michel Pagliaro, Lulu Hughes, Bruno Pelletier, Luck Merville, Corey Hart, The Four Tops, The Temptations, The group Whip Cream, Bob Walsh, The Montreal Symphonic Orchestra, Lara Fabian, Isabelle Boulay, and many, many more. He has also appeared on countless radio, jingles and television shows and recorded with many Quebec and international artists.